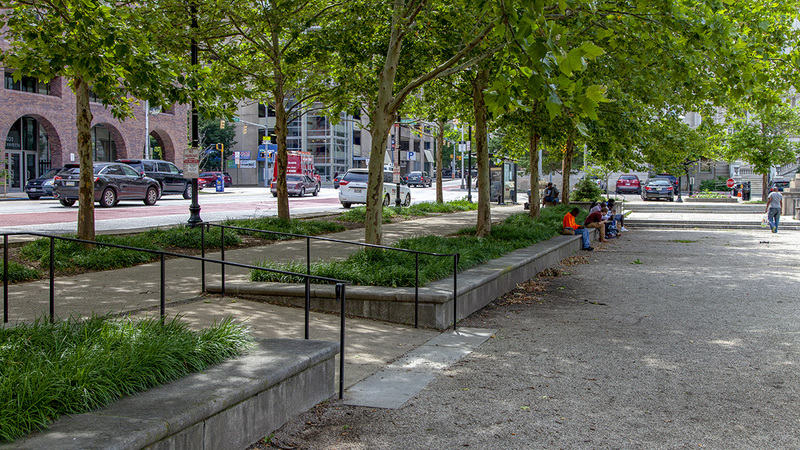 This open space near the center of Baltimore is a component of the city’s symbolic civic landscape. 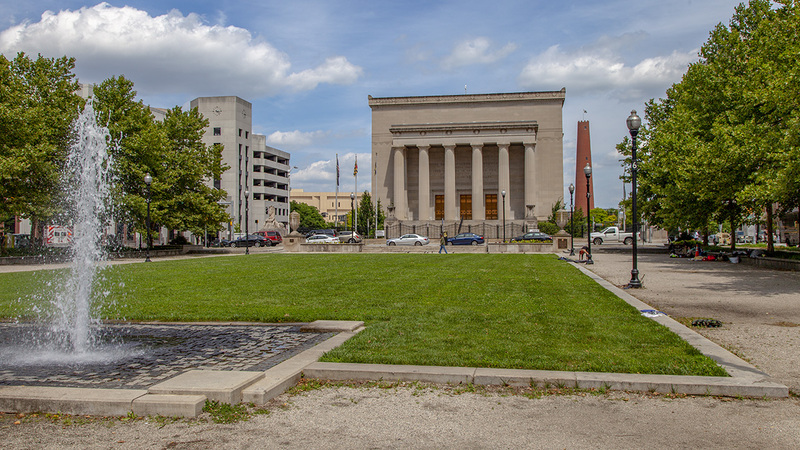 Following the conclusion of World War I, a joint commission between the city and state led a national competition for a war memorial. The design of local architect Laurence Fowler was chosen, and construction was completed in 1925. 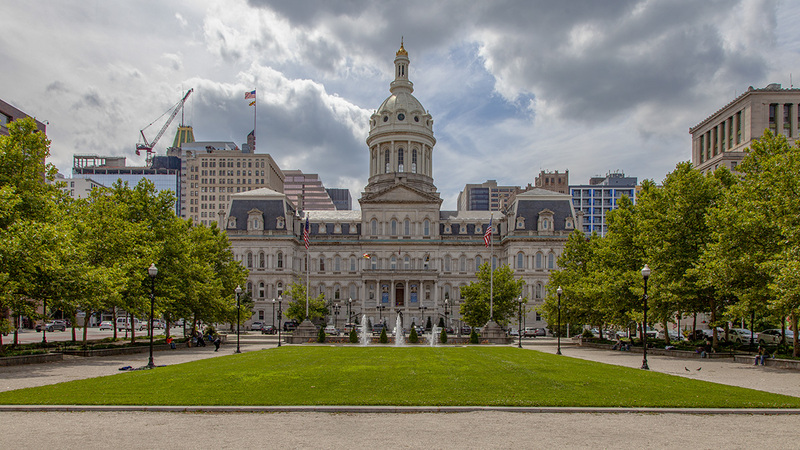 Occupying a full city block, the plaza is an integral element in the axially arranged civic al core of Baltimore that extends from St. Paul Street to the Jones Falls Expressway. 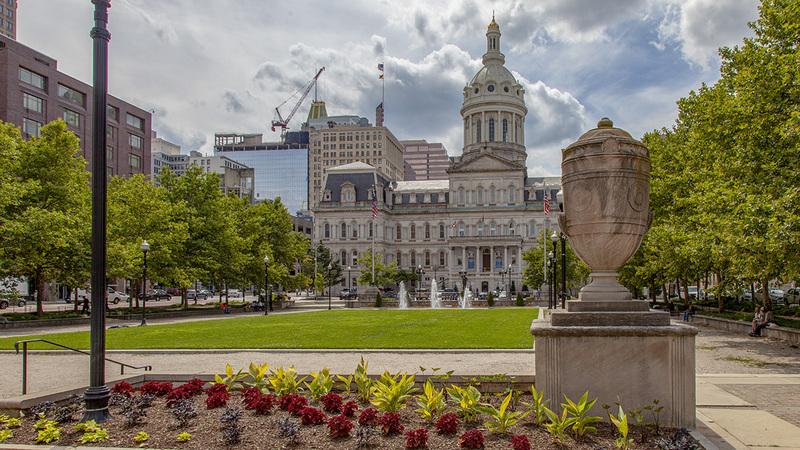 The plaza’s symmetric, highly formal arrangement complements the neoclassical War Memorial building (also designed by Fowler) and Baltimore City Hall, which face the site from the east and west, respectively. Allées of London plane trees flank a central rectangular lawn panel and define the northern and southern edges of the otherwise open landscape. 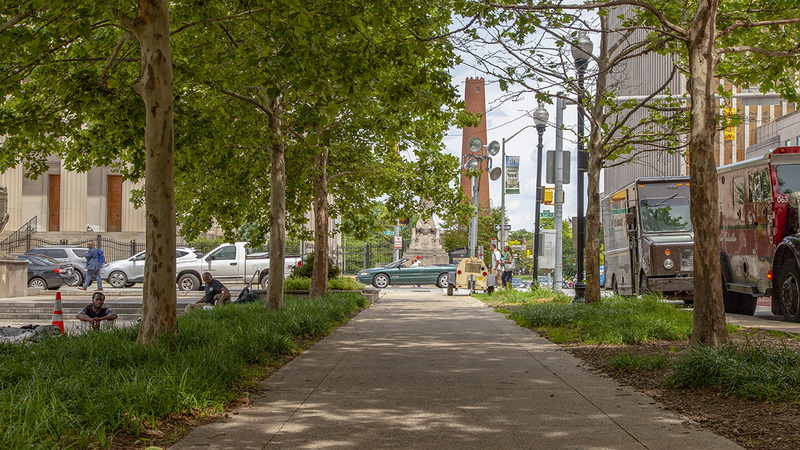 The continuous canopies provide shade along the perimeter of the plaza, which is entered through four landings at its corners. From the west, the ground drops slightly into the central lawn panel, bordered on all sides by a broad path of crushed stone flanked by seat walls. 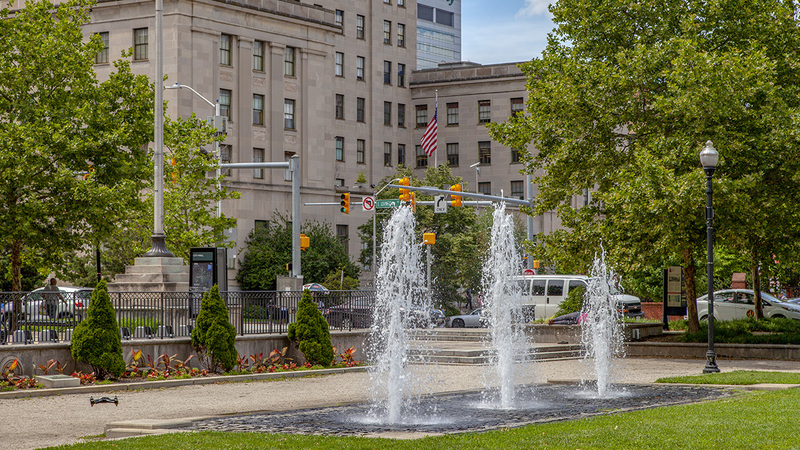 At the western edge of the expansive, flat lawn, a fountain comprising three water jets within a shallow basin of granite pavers further emphasizes the axial arrangement and functions as a focal point. 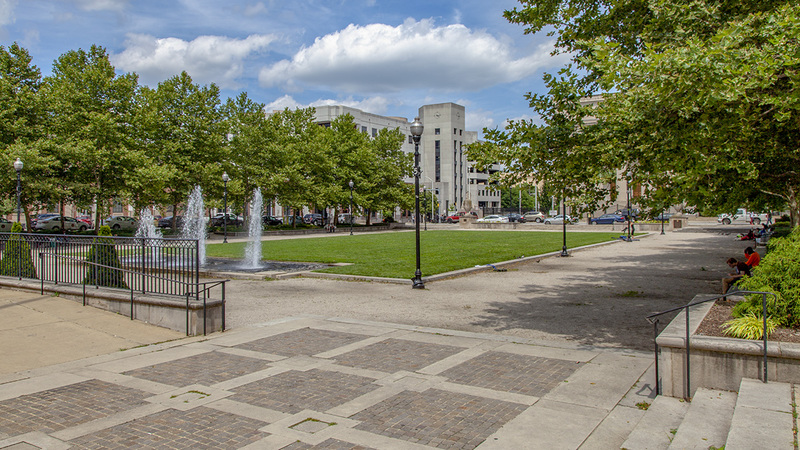 The east-west axial relationship is reinforced further with the pair of flagpoles that frame the view between the plaza and City Hall. 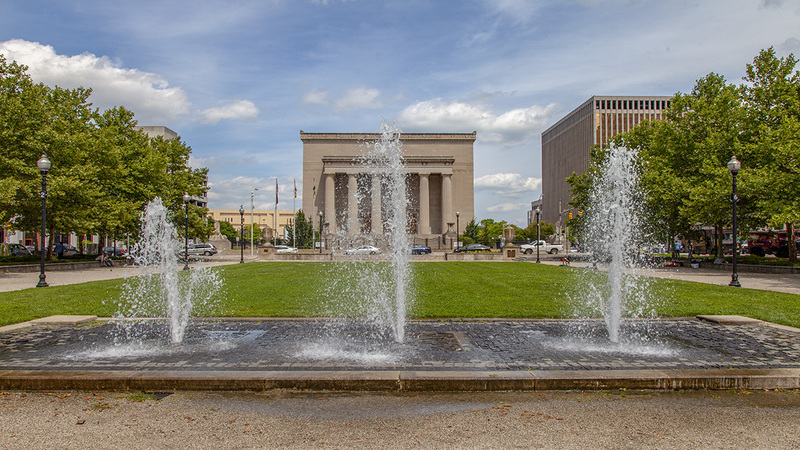 War Memorial Plaza is a contributing element of the Business and Government Historic District, listed in the National Register of Historic places in 1987.